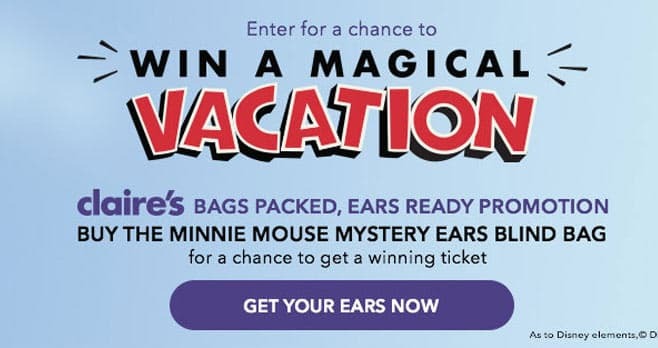 During the Claire’s Bags Packed, Ears Ready Sweepstakes, buy the Minnie Mouse Mystery Ears Blind Bag at Claire’s for your chance to get a winning ticket. You could win a family vacation to Walt Disney World Resort in Florida or Disneyland Resort in California. The Claire’s Bags Packed, Ears Ready Sweepstakes is open only to legal residents of the 50 United States (and DC), Canada (excluding Quebec), the United Kingdom, the Republic of Ireland and France who are 13 years of age or older at the time of entry. The Sweepstakes begins at 12:01 am EST November 22, 2018 and ends at 11:59pm EST of January 6, 2019 or once all Minnie Mouse bow-shaped cardboard game pieces have been sold and/or distributed. Limit ten entries per person regardless of method of entry. The grand prize consists of a 5-day / 4-night vacation for four (4) to Disneyland Resort in California or a 5-day / 4-night vacation for four (4) to Walt Disney World Resort in Florida. Visit www.claires.com to enter and see Official Rules for details.